HomeAll Posts...BarsYou certainly have to be into it, to wine it!! You did it. You completed one of the toughest events on the planet. You have earned the right to say #CheersToMe. 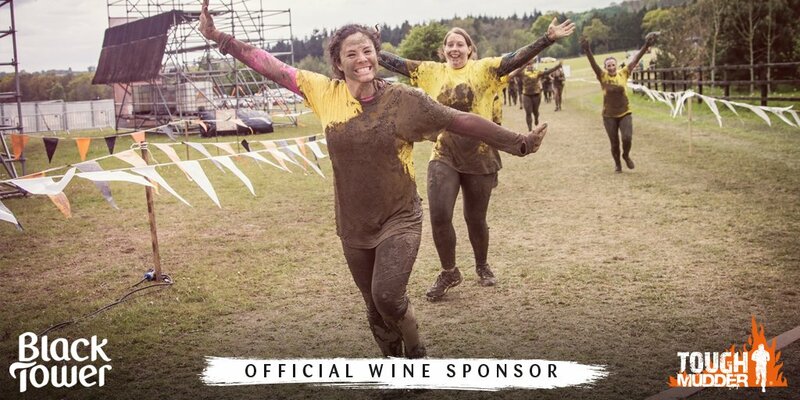 Now gather your tribe and celebrate your epic achievement with a bottle of Limited Edition Fruity White by the Official Wine Sponsor to Tough Mudder UK, Black Tower. Missing the mud? No problem! Just head down to your local supermarket and pick up a souvenir bottle of this wonderfully smooth wine. For just £5.99, you’ll be digging those muddy vibes all over again. Perhaps you’ve been training hard for your very own coveted headband? Well, you still deserve something tasty (all in moderation of course). Bursting with hints of fresh pineapple, ripe mango, sweet passion fruit and rich honey, this iconic white wine is the perfect celebratory treat after a successful gym session. Pair it with spicy chicken for the ultimate post-workout feast.The Black Tower Fruity White Limited Edition will only be available for a couple of months, so be sure to bag your muddy companion before it flies off the shelves. For half a century, Reh Kendermann’s Black Tower has stood the test of time and today it is still the No.1 wine brand from Germany in many countries. Along with Fruity White, the range also includes Silvaner Pinot Grigio, Sauvignon Blanc, Riesling, Rosé, Blush and Smooth Red as well as White and Pink Bubbly plus B by Black Tower, a range of low alcohol and low-calorie wines. A 1920’s term re-mastered into a way of life!